KOKOMO, Ind. 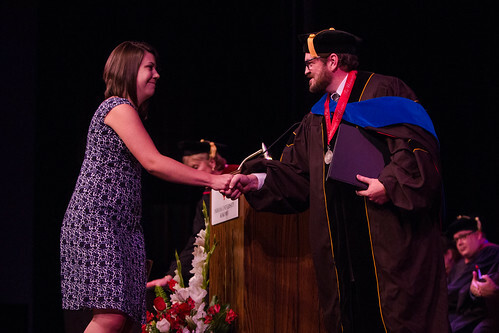 — Indiana University Kokomo celebrates academic excellence, with the annual honors convocation and master's hooding ceremonies. Hundreds of students crossed the Havens Auditorium stage during the Honors Convocation Monday, May 12, receiving certificates or plaques for being on the dean's list, providing excellent leadership on campus, completing the academic honors program, or for outstanding academic performance in their majors. Chancellor Susan Sciame-Giesecke commended the students for their commitment to excellence throughout their academic careers. "Your hard work, dedication, and commitment have played a role in your success," she said, adding that this success comes with responsibility. "I want to challenge you, our best and brightest, to lead," Sciame-Giesecke said. "I challenge you to use your skills to make a difference in the world. The IU Kokomo family is proud of you." Stephen Green, who earned a degree in new media, never considered himself a leader before he enrolled at IU Kokomo. His student experiences gave him confidence to step forward and lead, and changed his life. He decided to earn a master's degree in higher education and student affairs at Colorado State University. His excellent record of involvement and leadership at IU Kokomo helped him gain assistantships that will pay his tuition for his master's degree. He was thrilled and honored to receive the Outstanding Student Leader Award. "IU Kokomo gave me the ability to create myself to become a leader," he said. "It's opened the doors to what I want to do for the rest of my life." April Name, who received the outstanding student award in the new media program, credited individual attention from faculty as one factor in her success. She received a national design award for work she did with Erik Deerly, program director, to redesign a literary magazine. "I always work to be the best for myself," Name, from Kokomo, said. "This feels really good, and I worked hard for it." Nevin Bowden, Noblesville, earned the outstanding student in informatics award. He said small class sizes allowed him to learn and excel, and to participate in projects including designing a smart phone application for the Howard County Habitat for Humanity to monitor finances on the homes it builds. "I liked being able to work one-on-one with professors," he said. "I am glad to be done, and to be graduating." Krystyn Bell, outstanding student in communication arts, begins her first professional job Monday. She called her time at IU Kokomo "a real life-changing experience," after transferring from a larger school. "The professors invest so much time and effort into you, and it's really rewarding," Bell, from Peru, said. "They take a hands-on approach, and guide you through your entire educational journey. It was a real honor to receive this award, because there were so many great students in my classes. It makes me feel like I did something right." IU Kokomo also honored its graduate students, including the first-ever class in the Master of Science in Nursing (M.S.N.) program, with the traditional master's hooding ceremony. Each of the 38 students received the hood that marks him or her as earning a master's degree, from a mentor faculty member. The M.S.N. degree is just the next step towards her dream job teaching nursing students for Beth Robbins, who won the outstanding student award in that program. Robbins, from Greentown, was a manager for an area hospital when she enrolled, and accepted a job as education supervisor at IU Health Arnett Hospital in Lafayette while earning her degree. "Going back to school was a huge step," she said. "I just knew it was time to take that first step towards my dream job. The program itself is just phenomenal, and so was the growth we all experienced." Stephanie Fantuzzo, Kokomo, was inspired to earn a Master of Business Administration (M.B.A.) by her children, who were enrolled in college. "I love to learn and read," she said. "I love checking things off a list, and this is the biggest check mark on my list." She worked as practice manager for her husband's dental practice while going to school, calling it a "plate spinning act," to balance school with work and family life. She excelled in the program, earning the outstanding M.B.A. student award. Doug Preece, Peru, hopes to advance his career with the Air Force Reserves, after completing his Master of Public Management (M.P.M. ), and earning the outstanding student award in that program. His wife, Gloria, urged him to enroll after she completed her M.B.A. He feels prepared for future leadership roles because of the program. "It's taught me a lot about the administrative side that we're not always exposed to," he said. "I look forward to exploring new opportunities with this degree." For Gregory Ogle, earning a Master of Arts in Liberal Studies (M.A.L.S.) was more about enrichment and example than career advancement. His bachelor's degree was in electrical engineering, and he wanted something completely different for his master's degree. He earned outstanding student honors. "I wanted to set an example for my four grandchildren," he said. "My mother always said when you have an education, nobody can take that away from you. I'm passing the importance of lifelong learning to the next generation."